Every week for 17 years, I've heard my students ask, "What do I need to do to get an A?" Historically, many have focused on their grade rather than on fundamental skills. My attempt to change this mindset started two years ago when I gamified learning in my classes. After researching gamification and its potential to help students master skills and processes, I used the 3DGameLab and then Gradecraft to develop and implement game-based learning. In each class, students could choose "quests" that, if completed successfully, earned them badges and experience points. Each open-source badge was developed using Badg.us so that students could take them into the digital universe (e.g. attach to resumes, ePortfolios, etc.) and -- unlike grades on a transcript -- document skills they've mastered. Using gamification software alleviates the time it takes to build quests, award points, and track progress. A handful of web-based options are available for K-12 instructors including Gradecraft, 3DGameLab, Classcraft, and TheVirtualLocker. Any of these will streamline game set-up, management, and assessment. Using a gamifying management system, I modified traditional assignments into quests -- short learning activities that take 10-25 minutes to complete. Thus a task that would take an hour was turned into three mini quests. I recommend having 5-8 quest options open at one time. Associate each quest with a certain number of points relative to its level of difficulty. Gamers get to the top of a leaderboard by earning experience points (XP). Completing easier quests may earn 50,000, while challenging ones can rack up 200,000! Awarding so many points helps students focus away from 100 points = an A and more on skill mastery. Build choice into the gaming structure. Permit students to select the quests they are most interested in pursuing, and allow them to determine the level of challenge in each quest. 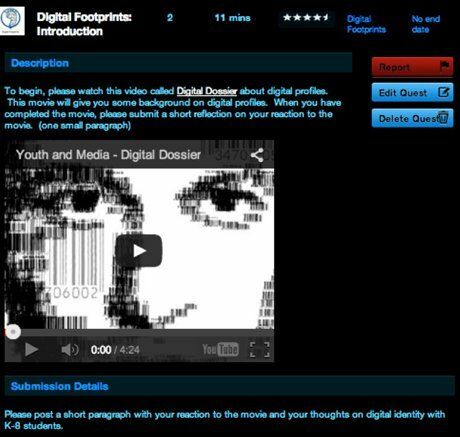 3D Gamelab screenshot: A quest on digital footprints. Provide opportunities for students to pursue a passion not available in the quests by allowing them to create their own quests and badges. 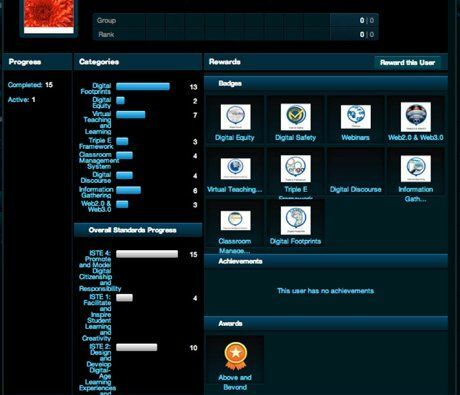 Integrate badges into the gaming software with online resources like Edmodo, Classbadges, Credly, or Passport, awarding them as skills are mastered and also to keep students engaged. Encourage learners to work together on quests, a common practice of gamers who team up in order to achieve an epic win. 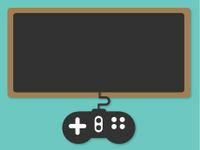 Set up a leaderboard in the software that students can opt into using anonymous gamer handles. Hide surprises in order to incentivize thoughtful gameplay. I drop in surprise rewards for grit, or award bonus points when students help each other pursue a challenging quest. In gaming, failure is not a negative, but rather an opportunity to learn from mistakes and correct them. 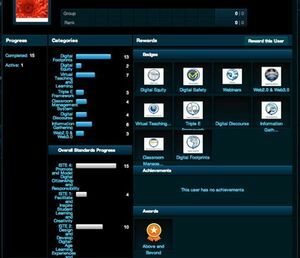 Set the gaming software to allow students to repeat quests without penalty until they have mastered the skill. In the software settings, require students to demonstrate skill acquisition before they move on to more difficult skills. Epic Win! What Worked in My Gamified Classrooms? The software provided large amounts of data on each student, allowing me to identify skills they were working on, how long they spent on a quest, badges earned, and standards met, as well as reading their feedback on each quest. All this data was used to further personalize and scaffold learning paths. Since each student chooses a gaming handle, I never knew which learner I was assessing and therefore avoided grading bias. Gaming forced me to give explicit feedback. I felt compelled to respond to each submission quickly, knowing students were diligently checking to see if and how they could level up. I awarded bonus points for grit skills, such as perseverance. Seeing these skills being awarded points, students were motivated to work on challenging quests and help their classmates. Epic Fail! What Went Wrong? Offering too many quests overwhelmed my students. They would log in, see 25 quests, and not know where to begin. Today, I make no more than eight options available at any given time. Instead of motivating them, reaching the top of an "academic" leaderboard was considered "uncool." Today, I allow students to opt out. I gamified my classroom in the hopes that students would no longer ask about their grades. Ultimately, students did focus more on academic and grit skills (especially when I began returning quests instead of simply assigning low grades to mediocre submissions). Would I do it again? Absolutely! Have you gamified your classroom? Please share your lessons learned and best practices in the comments below.